Does sugar have a hold on you? Are your cravings out of control? Does your energy spike and dip throughout the day – especially around 3pm? Are you relying on sugary treats to give you an energy boost? Do you often feel tired, lethargic, or experience unexpected mood changes? What about brain fog, cloudy thinking, or trouble falling or staying asleep? Or maybe you want to make positive changes, but you find yourself constantly slipping back into old habits? The 21-Day Sugar Detox is a clear-cut, effective, real-foods-based program that supports your body in naturally detoxifying from sugar cravings. Tens of thousands (including me!) have overcome their own sugar and carb cravings, detoxed their bodies from sugar and found food freedom through the 21-Day Sugar Detox program. Pregnant or breastfeeding? We have modifications for you! Pescetarian (vegetarian who also eats seafood)? There’s a plan for you! Athlete or have a very active lifestyle? We’ve got you covered! Have kids that you want to get away from the sugar monster? I can help! 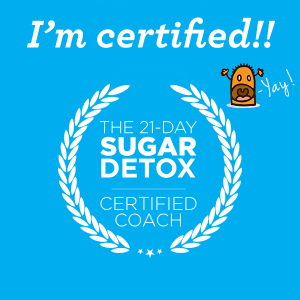 As a 21DSD Certified Coach, I can provide you with extra support, encouragement, and resources to help you kick sugar out of your life and enjoy real food. We are more successful when we do things together! Access to my expertise as a Nutrition Educator, which means I can answer your questions and concerns about nutrition that go beyond the 21DSD. 4 live sessions (local groups only)–this is where we’ll get to know each other, chat about what to expect during each week of the program, and I’ll answer all your questions. Plus, I’ll bring snacks! Conference calls and meeting recordings–I’ll record my live sessions and/or conduct conference calls for online-only groups, which you can access and listen to later. A private Facebook group with daily support–this is where we’ll connect every day! I’ll post expectations for that day, motivational quotes, interesting articles, recipe ideas, and much more! You’ll get daily accountability and interaction with group participants and I can answer your questions in between sessions. An exclusive participant workbook–this is a valuable tool that will give you even more resources throughout your 21DSD (and it’s only available by working with a 21DSD Certified Coach). Contact me if you’d like to set up a private group for your community or workplace. Participants must own a copy of The 21-Day Sugar Detox (minimum). It is also recommended that participants purchase The 21-Day Sugar Detox online program which contains continually updated supplemental guides, meal plans, a members-only forum, and much more. This was my first time cutting all sugar out of food. I had the most difficult plan but in reality I really wanted to try it and the benefit of doing it out weighted the fear of not having something that had sugar in it. The support from Rebekah, the other people, the encouraging daily words, and the guides made it easy to go through. I would definitely encourage others who think they might want to try it to do it, its only 21 days not a lifetime (unless you choose to do that). Its a great eye opener to what you put in your body and what benefits you reap when your body has nutritious food in it! –Mary L.
Let me start out with a personal note; prior to my introduction to the 21DSD program I didn’t realize the amounts of sugar I was putting into my body and what it was doing to me. I will continue with the program. It works and I feel better! –Dwight W.
The program was great. There was a lot of interaction available with her. Lots of helpful posts in the Facebook group. She is quick to respond to questions and always had some motivational or inspirational posts to help get you through the day. –Mandie K.
Working with Rebekah was really helpful during my 21 DSD. I loved the accountability of working with a coach and a group of other women who all had the same goals. Thanks to the detox I have kicked my sugar monster to the curb! –Fiona D.
Note: some of the links on this page are affiliate links, which means that I earn a small percentage when you use my link to make your purchase. The price doesn’t change for you, but the amount I earn helps me maintain this website and continue providing you with great content.